Under President George W. Bush, who was the Herbert Hoover of his day, appropriated government programs grew from $298 billion to $613 billion. Under President George W. Bush, Social Security spending went from $406 billion to $662 billion. Under President George W. Bush, Medicare spending went from $216 billion to $425 billion. Under under President George W. Bush, Medicaid spending went from $117.9 billion to $259 billion. Under President George W. Bush, “miscellaneous spending” went from $290 billion to $673 billion. 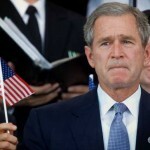 Under President George W. Bush, net interest dropped from $222.9 billion to $139 billion. Under President George W. Bush, disaster cost went from $0 billion to $4 billion. In George W. Bush’s eight years, government spending increased more than 55 percent, largely due to woefully misbegotten wars. Even when adjusted for inflation in constant dollars, federal expenditures under Bush soared by 29 percent. During his Presidency, real Gross Domestic Product (GDP) only increased by 17.3 percent, and over the Bush years, real government spending went up nearly twice as fast as the actual U.S. economy. 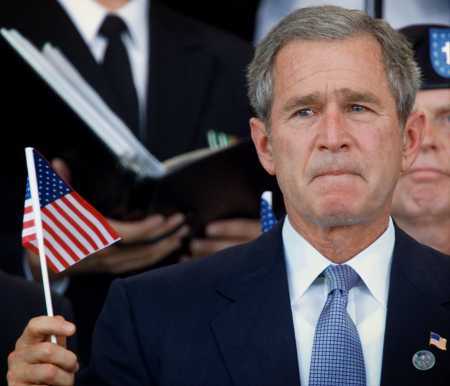 The left should therefore be in love with George W. Bush. He, like his father and like Ronald Reagan, was a complete statist. Under George W. Bush, Washington ran deficits almost every year. Total federal debt doubled and rose from 58 percent to 66 percent of GDP, for a 14 percent increase in taxpayer debt burden (in terms of the Gross Domestic Product). •	Payment for Individuals: $1054.6 billion in the year 2000 to $1397.1 billion in the year 2007. •	Social Security and Railroad Retirement: $410.5 billion in the year 2000 to $487.7 billion in the year 2007. •	Federal Employees Retirement and Insurance: $100.3 billion in the year 2000 to $116.0 billion in the year 2007. •	Unemployment Insurance: 21.1 billion in the year 2000 to 27.1 billion in the year 2007. •	Medical Care: $362.7 billion in the year 2000 to $559.9 billion in the year 2007. •	Student Assistance: $10.9 billion in the year 2000 to $24.9 billion in the year 2007. •	Housing Assistance: $24.1 billion in the year 2000 to $27.0 billion in the year 2007. •	Food and Nutrition Assistance: $32.4 billion in the year 2000 to $46.3 billion in the year 2007. •	Public Assistance and Related Programs: $88.3 billion in 2000 to $103.4 billion in 2007. •	Other Transfers to Individuals: $4.3 billion in 2000 to $4.7 billion in 2007. Of course, there was also the $700 billion Troubled Relief Assets Program (also known as the TARP bailout), and yet if you think these figures are difficult to fathom and the expenditures over-the-top, I assure you they do not even begin to compare to the massive spending apparatus that Barack Obama has unleashed. Indeed, next to Barack Obama, George W. Bush’s reckless spending is downright frugal. It is hard to stomach Bush’s liberalism, based on these numbers, but the last line says far more: “Indeed, next to Barack Obama, George W. Bush’s reckless spending is downright frugal.” Obama’s all-government-all-the-time ideology is sparking a revolution only blind liberal fools (like Obama, Reid, Pelosi, et al) can ignore. tendencies of a Democratic White House, they were more apt to fight to keep spending under control. When Republicans took control of both ends of Pennsylvania Avenue, however, the story changed’”. The party that used to blast the Democrats for spending ‘our hard-earned money’ on every social welfare boondoggle under the sun started the doing exactly the same thing. The republican controlled big government also brought in such freedom loving polices such as extraordinary rendition, torture, indefinite detention without trial, a massive assault on the rights of American Citizens through the patriot act and embarked on ill concieved, illicit wars based on totally fabricated evidence. Of course Obama and his democratically controlled congress have done nothing to reverse these policies so I guess a pox on both their houses is in order.